Diamond Details: Round brilliant cut white diamonds, H-I color, VS2-SI1 clarity, with excellent cut and brilliance, weighing .85 carat total. Gemstone Details: 2 cushion cut aquamarine stones, of exquisite color, weighing approximately 4.00 carats total and each measuring 8mm x 8mm. Earring Design: Charles Krypell 18k white gold design. 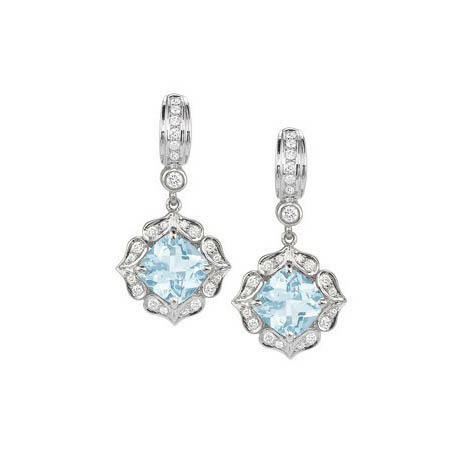 This elegant, Charles Krypell 18k white gold dangle earrings, contain 2 cushion cut aquamarines, of exquisite color, weighing approximately 4.00 carats total and each measuring 8mm x 8mm with 94 round brilliant cut white diamonds, H-I color, VS2-SI1 clarity, with excellent cut and brilliance, weighing .85 carat total. Simply irresistible!